Women have what is called an “advantaged mortality profile” versus their male counterparts. This includes both biological and behavioral reasons. Biologically speaking, estrogen helps protect women against heart disease, and women have stronger immune systems partly because testosterone causes immunosuppression. Women also visit their doctors more often and drink less alcohol than men, which contribute to lower mortality rates for women than men. 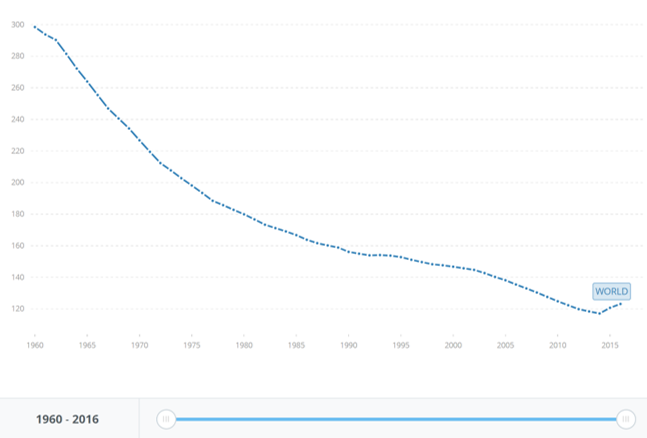 The mortality rates of women continue to decrease around the world. The provided graphic illustrates the mortality rate decrease in women from 1980-2016. Source: ( 1 ) United Nations Population Division. World Population Prospects: 2017 Revision. ( 2 ) University of California, Berkeley, and Max Planck Institute for Demographic Research. The Human Mortality Database. Similar decreases in mortality in women are being recognized in the United States as well (despite some life expectancy decreases due to the opioid overdose epidemic). The mortality rate of women experienced significant decreases over this same time period. To further support this we can take a look at the increase in life expectancy. The present life expectancy of a woman in the United States is 81 years (vs. 76 for men). AUTHOR’S NOTE: While not often discussed, there is another factor that needs to be recognized: the role of women as caregiver. Women, whether partners, spouses and/or mothers contribute significant imputed and realized value to the household. Simply put, women can’t afford to die because they are needed for their capacity to nurture and sustain the household. Further exploration is necessary to compare and evaluate the hardwired biological and behavioral nature behind the caretaker role and how that may play a part in lower mortality rates (longevity). What Does a Life Insurance Policy Pay For?